Offers above is only for “Lux Apartments” and they are active from 26.04.2019. until 02.05.2019. Payment in RSD equivalent at the middle exchange rate on the payment date. Prices do not include tax, which is 120.00 dinars for adults and 60,00 dinars for children from 7 to 15 years, the guest insurance is not include and it is 20,00 din daily by person. Please schedule use of wellness and Salt Cave at the front desk. 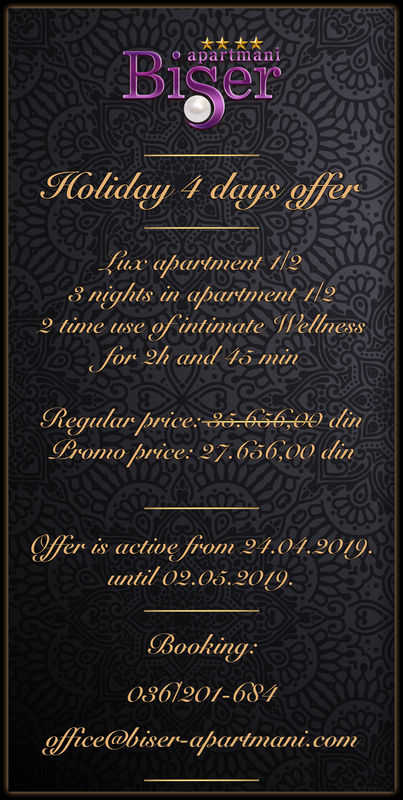 Offers above is only for “LUX Apartments” and it is valid from 26.04.2019. until 02.05.2019. Offers above is for all type of apartment except Lux apartment 1/1 and it is valid from 05.04.2019. Offer stand for minimum 3 nights. When booking is made the advnce payment of 30% is obligated.